China's President strengthens ties with Washington State. China delegation strengthens ties with Washington State. It’s not surprising that Seattle, Washington was the first stopover for China’s President Xi Jinping on his official visit to the United States. 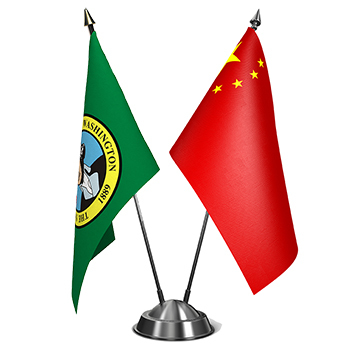 Washington is the leading state in U.S. exports to China and the country is the No. 1 trading partner of the Port of Seattle. During President Xi’s stay in Washington State he is meeting with U.S. and Chinese business leaders in aerospace, technology and manufacturing. The visit has expanded collaboration between China and Washington State. Bill Gates announced a formal agreement between TerraPower and the China National Nuclear Corporation to jointly work on the development of a small-scale nuclear reactor that is more safe and efficient than existing technology. In aerospace announcements, China has ordered 300 Boeing aircraft. And, to meet the needs of the growing China aviation market, Boeing has agreed with the state-owned Commercial Aircraft Corporation of China to set up a plant for finishing 737 aircraft in the country. Read more in Yahoo News. Renewable energy, clean technology and advanced manufacturing were additional areas of collaboration being discussed. Washington companies, Intellectual Ventures and Stratos Group, have started talks with representatives of the Chinese Academy of Sciences on sharing resources to study renewable energy. Washington tech companies are looking at setting up a clean tech incubator with links to a similar one opening in Shenzhen. The possibilities include research facilities that could collaborate on climate change, reducing energy consumption in manufacturing and alternative energy production. Industry leaders in Washington State and China have forged strong ties as trading partners for many years and are now looking towards shared resources and expertise to tackle problems facing global economies.